Little is more dangerous to U.S. forces fighting insurgents in hot spots around the world than improvised explosive devices. It's the weapon of choice for under-funded forces aimed to attack American soldiers with low risk to themselves. 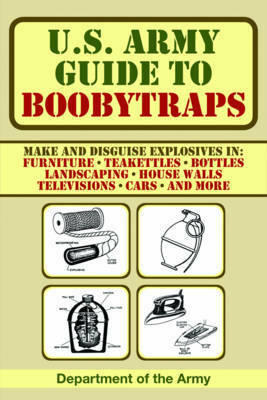 This official U.S. manual is the complete guide to using and dismantling boobytraps. Here you can learn how to assemble, use, detect, and remove boobytraps and demolition items in almost any situation. With intricate and detailed diagrams, you'll discover how army troops can disguise boobytraps in household items such as irons, teapots, and televisions; in structures such as window frames, stairways, and wooden beams; and in outdoor areas, in bushes and underground. 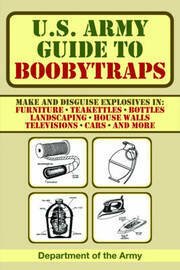 Find out how boobytraps work, why they are used in the army, and the tactics behind their set-up. Learn the mechanics of the various types of firing devices, detonators, fuses, cords, adapters, blasting caps, and lighters. Also included are detailed instructions for detecting and removing boobytraps. The U.S. Army Guide to Boobytraps explains the responsibilities and safety issues that should be thoroughly understood by anyone using any weapon. Any military enthusiast will appreciate the level of detail this field manual offers.